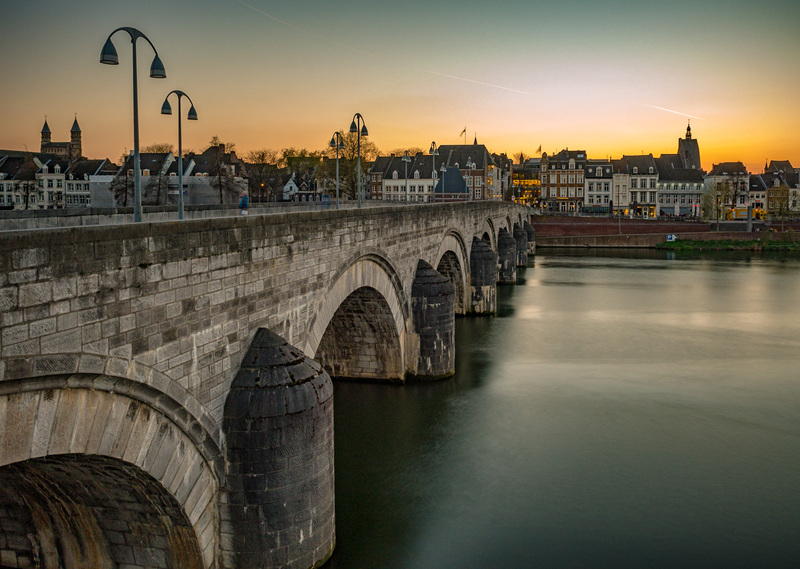 As the oldest city of the Netherlands, located within a walking distance from the borders of both Belgium and Germany, Maastricht has so much to offer!. If you’re a history, culture, arts enthusiast, you’ll absolutely love this beautiful city. With a long history – tracing back to the Roman era, spectacular monuments, magnificent cathedrals, and beautiful old houses/streets, Maastricht is full of surprises and is perfect for a weekend trip. Here's all you need to know. By Road: We drove. It’s about 2 hours’ drive from our home /Amsterdam. By Flight: If you come flying, Eindhoven airport could be the nearest (approx. 1.5 hours drive); From Schiphol, it’s 2 hours distance and the same travel time if you land in Belgium/Brussel too. By Train: Maastricht is well connected with train, you can reach the city center from almost everywhere in the Netherlands, Brussels(Belgium) or from Dusseldorf (Germany). There are plenty of options for accommodation in the Maastricht., ranging from student hostels, motels to 5-star luxury villas. But, we stayed at Lanaken – a nearby town in Belgium. It is less than 10 minutes’ drive (6.5 Kms) from Lanaken to Maastricht city center and it is very cost-effective! we got a 4-star hotel double bedroom with breakfast for just 60 EUR /night. Walk: Yes, we parked our car in the city center and walked all over. Probably, walking is the best way to Maastricht (perhaps, true for any city in Europe!). If you are a little immobile or has less time, you can choose to go by bike or a city tour bus. No light, no noise, no smell, no radiation, no pollution, no reach with your phone, no time since ... inside the caves. It was really one of the lifetime experiences. There is absolutely something so captivating in these hidden caves, you can feel the symbols of love, perseverance, courage – and on the contrast: war and suffering! You might have seen many mind-blowing bookstores and libraries, but this one is certainly unique! Here in Maastricht, a 700+ years old glorious Gothic cathedral is now transformed into a full-fledged beautiful bookstore. Hence this is truly a “temple of books” and probably the Dutch’s way of saying, "a good library is equal to (if not better than) a Church, Temple or a Mosque!”. Though tucked in a sleepy street, the Natural History Museum (NHM) is an interesting place and attracts quite a lot of visitors (both local as well foreigners) all through the year. This place is almost in every Maastricht tourists’ itinerary. It not a large natural history museum, but certainly it does provide an exceptionally interesting insight into the prehistoric period, especially to the south Limburg region and there's so much to learn. If you have a couple of hours, it’s worth to see. ➤ Please read my other post “Why you should visit the NaturalHistory Museum of Maastricht". De Bisschopsmolen (The bishop's mill) is the oldest, a 7th-century water mill in the Netherlands and still actively grinding different grains to provide flour for the tasty breads and pastries!. The bakery is located at the center of the Maastricht city. You don’t need your google maps to navigate to the location; If you walk past the Basilica of Our Lady (Basiliek van Onze Lieve Vrouwe), the delicious smell of freshly-baked breads and pie/tart will take you to the bakery, it’s hard to me missed😜. 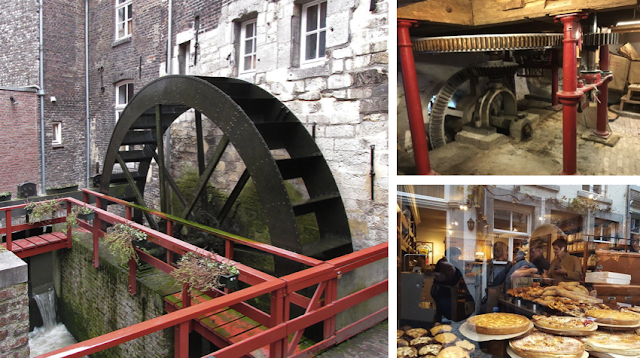 ➤ Please read “De Bisschopsmolen - Bakery that uses the oldest Watermill of the Netherlands". 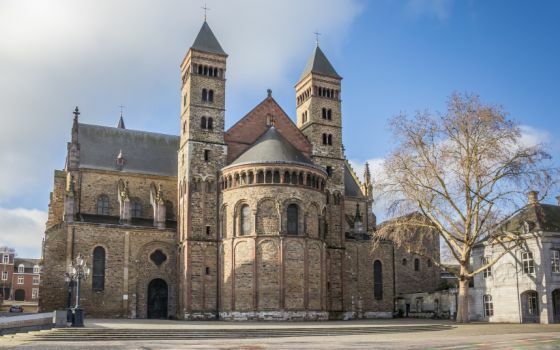 This 6th century Roman Catholic church was built on top of the shrine of Maastricht’s first Bishop. It’s so beautiful with its magnificent architecture, fine blocks and 1000+ years old paintings. The main attraction of this church is its treasury, which is now serving as a museum. The Treasury is filled with gold & silver art wonders from the medieval period. You may start with the tomb where Saint Servaas was buried and continue enthralling the beauty of rest interior in the church. The tall white ceilings and large stained-glass windows give the interior a light and expansive look, just enjoy this beauty of Romanesque architecture. This is another 1000+ years old beautiful candle-filled church 😜. There are several bus stops nearby and the basilica is a short walk from the city center. Just stroll through the wide dark corridors of the Our Lady Basilica and admire the art and murals dating from the Middle Ages. Probably, the main thing here is the “Sterre-der-Zeekapel (Star of the Sea)” – the wooden statue of Holy Maria, dates back to the 15th century. For centuries pilgrims from all over Europe travel to this statue and claim to be cured of many sufferings. I don’t know how true it is., but the statue as well the whole church looks so beautiful and mesmerizing to watch. ➤ The building is open daily and is free of charge. The Helpoort is the oldest preserved city gate in the country and the only one in Maastricht. The impressive stone structure dates from 1229 when Maastricht acquired its city rights. The gate has been in service for about two centuries as part of the city wall. Since then, it has been used as a weapon room, herbal house and artist studio. Thanks to extensive restoration work in the 20th century, you can now enjoy the gate as it should have looked in the Middle Ages. We couldn’t visit this important attraction, so can’t comment much about it! This graceful, dome-shaped building, is located on Avenue Céramique on the banks of the river "Maas", also famously called as Meuse ( I think, it's French?). It is a 15-minute walk from the city center and a regular bus service runs here. You can also park here for a fee. The museum is closed on Mondays, excluding national holidays. An entrance fee is required. The Vrijthof is a picturesque square, paved with pebbles and surrounded by neatly carved old trees. The original function of the square was less scary; it was first used as a cemetery and later as a venue for executions😜.. But now, this is the main square in the city center and regularly many events are organized at the Vrijthof. The most important event is the Carnival in Maastricht, happens each year at the beginning of the fasting time, celebrated in this square. If you are visiting Maastricht in the summer months, you can attend one of the classic outdoor concerts. You visit any day, you’ll always can see/participate in a concert/event here!. The Sint Servaasbrug is probably the oldest still existing bridge in the Netherlands and was built in the late 13th century. This magnificent bridge is now being depicted on new euro coins as well! If you have not walked over this bridge, you have not been to Maastricht 😜.. This beautiful bridge holds an interesting architecture, also inevitable part of Maastricht’s history. Maastricht has several bridges, but when some local/historian refers "The bridge", it’s always means the St. Servaasbrug!. A common thing to almost all the touristic cities of Europe – Boat tour!. The surroundings of Maastricht are beautiful from the water. Get on board one of the cruises of Rederij Stiphout (is the company provides boat tour here) and enjoy the beautiful landscape of the whole Limburg region; these tours take you all through the Maastricht attractions and upto the Belgium border. ➤ Ticket price varies time-to-time and depends on packages. ➤ Refer the website www.stiphout.nl for more details. I was not really excited about these caves when I heard about them first. Thought, after all they are man-made and "just another" attraction to fool the tourists. But after visiting the caves, my view has completely changed, I'm so impressed! Whoever complains about our 9-5 job, should visit these caves to realize the definition of hard work. At a freezing cold temperature combined with a nasty 98% humidity, the people of Maastricht have sawn-off more than 200 kilometers long underground marl-stones to build this defense system. These mountains of Marlstones (sort of/like limestones) were formed from the accumulation of bones and shells of animals deposited at the bottom of the then sea. (It’s not hard to believe that this portion of Netherlands was a sea once, Isn’t it?). Romans, during their era in the Netherlands (50 years Before Christ) materialized the limestones as a building / construction substance. Though limestones are very soft in nature, they get extra-strong when let them dry or heat. That was the start of these caves! They took away tons and tons of limestones from these mountains for construction of houses, churches, safety walls and towers. We can still see many houses in the Vrijthof Square (the center of Maastricht) constructed with limestones. Continuous evacuation of stones started making caves / tunnels underground. Then, in the late 17th century when this region has become a favorite of all the invaders, people of Maastricht started used these caves as their temporary hiding station. With a fertile delta created by river “Mass”, this region was always on demand; Maastricht city was invaded 21-times by different empires and dynasties; and every time these caves provided safe shelters to the local people. People extended the tunnels to move from Netherlands to the Belgium region underground, and vice-versa. We can still see some writings and paintings from the 17th century inside the walls of the caves. They made not only mandates like toilets and cooking ovens inside, but also built a deep well for water inside the caves. These tunnels were extended to about 14-kilometer-long during the 18th century, so that I could house up to 25,000 refugees. The caves underneath the Saint Pietersburg Mountain made a critical contribution during the World War-II. It’s known that as much as 45,000 people were living inside these tunnels for about 10 days. Then there came ENCI (Eerste Nederlandse Cement Industrie) translated as the “First Dutch Cement Industry) who made good use of these limestone caves and extended them to a maze of 20,000 tunnels and to a distance of 230-kilometer long. In the early year-2000 period, ENCI stopped excavating further, since all the usable stone layers were run out. But already a large portion of the corridors got demolished because of the dynamites used during stone excavation. We see only about 80 kilometers long corridors are existing today. Around 2006 period, the Dutch national art treasures took over these caves and started allowing tours inside these caves. Above is the original tunnel system found inside the caves. Heard that this was drawn in the 1940’s. Everything on the left of the red line has disappeared and, who knows, some of it may have been used for the construction of your home (wherever you’re in the world; ENCI was the main supplier of cement for the whole world during that period!). Tourists can get-in to these caves through 3 entry points: Fort St. Pieter, the North Caves, the Zonneberg Caves and the Casemates. You see those entrances marked in the above maps as well. We entered through the St. Peter's Fort. The blue line on the right of the above map is roughly the path we followed during our guided tour. The Zonneberg Caves are a little further south and, just like the North Caves, they form part of the large cave area there used to be. The Grotten Noord (North Caves) are the easiest to reach from the center of the city. You can walk (takes about 25 minutes). You can also take a bus, line#7 in the direction of St Pieter and get out at the second stop on "Mergelweg, St Pietersberg". Zonneberg is bit away from the city, not easily accessible by public transport! you can reach by car (15 minutes) or bicycle (20 minutes) from the Maastricht city center. 💭 This experience is not for those with claustrophobia or who are afraid of the dark. 💭 The temperature in the caves is 9 to 10 degrees Celsius so visitors are advised to bring a vest, sweater or jacket. 💭 Some floors are uneven. Please take care when walking on such floors. 💭 Don’t worry about your kids – Initially, I was bit skeptical and scared about taking my 6 years old daughter inside the caves. But, nothing to worry, my daughter really enjoyed the whole tour. OVERALL: No light, no noise, no smell, no radiation, no pollution, no reach with your phone, no time sense ... inside the caves. It was really one of the life-time experiences. There is absolutely something so captivating in these hidden caves, you can feel the symbols of love, perseverance, courage – and on the contrast: war and suffering. I really like the caves, I would return again to see the other parts of the caves. ➤ All tickets are time-boxed and non-refundable. So if you’re not sure on your arrival time, better to buy the tickets on-the spot. All the 3 places have a ticket office next to the entrance. Though tucked in a sleepy street, the Natural History Museum (NHM) is an interesting place and attracts quite a lot of visitors (both local as well foreigners) all through the year. This place is almost in every Maastricht tourists’ itinerary; so, we also joined the list. This is comparatively a smaller museum, but still has interesting exhibits of over 550,000 artifacts in the field of geology, paleontology (science of fossil remnants), Botany and zoology collections from / around south Limburg region of the Netherlands. GROUND FLOOR: The museum display starts on the ground floor, taking the visitors ~350 million years past on a geological journey. Each artifact was unique and pacts with the physical structure and substance of the earth, their history, and various events/processes they went through. It was a surprise to learn that the Maastricht region was once a deep sea which later changed into a shallow mountain range, predominantly making the source of lime stones. Probably, “Ber” – the skeleton of the famous Mosasaurus found in the Maastricht is the top attraction of the ground floor (as well for the entire museum). This 67-million-year-old Mosasaurus was discovered by paleontologists in a lime quarry of south Limburg region by the year 1998. It was interesting to know that this Maastricht “Ber” is the inspiration and featured in the famous science fiction film “Jurassic World (2015)”. We also learnt that the very first set of Mosasaurus ruins were also found in the same region, about 200 years ago. But the same was seized by the French – the then rulers of the Netherlands. You can see the same in the Louvre museum of Paris. However, the NHM tells all the history by show-casing a replica of the same first ever Mosasaurus! The skeleton of a “Allopleuron hofmanni” - a giant primeval sea turtle, which died 66 million years ago, is also on display. We learnt that this giant turtle was from the cretaceous period, same as the era when dinosaurs were alive. Dutch archaeologists discovered this rare stuff in the neighborhood of Maastricht. FIRST FLOOR: The exhibition continues onto the first floor, slightly moving into the modern era. This includes many interactive displays of birds, insects, and a few special creatures. You get to see the discoveries from woolly rhinos and mammoths, also found in the Maastricht region. Below the ground floor, underground you have an interesting display of an artificial cave (or) a typical set-up of an excavation site. There’s a small garden outside, and you can see a tiny botanical garden behind the museum, on the banks of the river Jeker. 👍 “Ber” - the Jurassic World famous Mosasaurus. 👍 Interactive Birds display (with their sounds), Displays of Honeybees and Butterflies were also quite interesting. 👎 I expected a little more English explanation / information in the Science related museum in Maastricht - a city that’s so international; but was left with disappointment. In the ticket counter, they do provide an English leaf-let, but it’s not so handy. 👎 Relatively small, we took only 2 hours to tour the entire museum. If you’re not so enthusiastic about intricate details of the earth/ground/fossils and prehistoric wild-lives, then it may be even more shorter for you. OVERALL: Yes, it not a large natural historic museum, but certainly it does provide an exceptionally interesting insight into the prehistoric period, especially to the south Limburg region and there's so much to learn. If you have couple of hours, it’s worth to check-in. De Bisschopsmolen (The bishop's mill) is the oldest water mill in the Netherlands and still actively grinding different grains to provide flour for the tasty breads and pastries. This mill was originally built in the 7th Century for agriculture & other purposes, but in the later 11th century, it was reshaped for grinding and running till today. The accompanying bakery uses flour from this Watermill for making their delicious menu. The bakery is located at the center of the Maastricht city. You don’t need your google maps to navigate to the location; If you walk past the Basilica of Our Lady (Basiliek van Onze Lieve Vrouwe), the delicious smell of freshly-baked breads and pie/tart will take you to the bakery, it’s hard to me missed😜. Bisschopsmolen bakers say that they use grains from the local farmers and add no chemical ingredients, that makes their specialty “limburgse vlaai” (Limburg’s Pie). Everyone’s welcomed to visit their kitchen, and also can bake a taart yourself. They do conduct interesting baking workshops for kids and guided tour for groups. We had our light lunch at their small restaurant, tasted their favorite wrap and vlaai; it was wonderful with a nice coffee. Their small shop next door sells all sort of ingredients that you can take-away and bake at your home. Overall: It’s definitely interesting to see an authentic way of making breads using an old watermill and great place to enjoy a quick lunch/drink; but that’s it., take a look at the below notes as well! 💭 It’s too small for the crowd it attracts. Forget about table availability, there’s not enough space even to stand. 💭 If you are a vegetarian or you don't eat beef/pork, then your menu options are very limited. 💭 It’s not entirely “gluten free”; they use the same ingredients and machines/kitchen for all the dishes. You should be cautious if you’re too sensitive. I have seen many mind-blowing bookstores and libraries, but this one is certainly unique! Here in Masstricht, a 700+ years old glorious Gothic cathedral is now transformed into a full-fledged beautiful bookstore. Hence this is truly a “temple of books” and probably the Dutch’s way of saying, "a good library is equal to (if not better than) a Church, Temple or a Mosque!" The Dominicanen Church (formerly known as Selexyz Dominican Cathedral) was established in the year 1216. But the people of Maastricht stopped using this church for religious functions ever since 1804. In the last 200 years, the building had been used for many purposes before it turned into a bookstore in 2006. Dominican bookstore has an enormous collection and wide range of books – you can find books of culture, history, fiction, music, professionals and all upto the kid’s books. They do have a large collection of English, French and German books too, which is a great news for the internationals & tourists and make it as tourist attraction as well. Bookstore Dominican also serves as a cultural stage. There are regular lectures, debates and music performances and space for exhibition. Overall, it’s an amazing bookstore / library. If you have couple of hours in the Maastricht, you’d visit this magical place and am sure, you'll be pleased! 💭 If you are there just to read books and enjoy a coffee, it's perfect; but if you're planning to buy, be prepared for a 10 minutes long queue at-least. The billing counters are very limited. 💭 I didn't find any elevators to reach the 1st and 2nd floors, I think you'll have to use only the stairs, hence wheelchairs are not accessible (only to 1&2 floors). It’s autumn holidays here and the whole Netherlands looks more beautiful than ever!. With an exquisite blue sky (which is a rare commodity in the Holland😛), trees full of golden yellow & copper colored leaves, it is a real treat to the eyes. Will you ever miss such an opportunity?, we didn't. We packed our bags for the 2 days Maastricht trip. Maastricht is the south most city of Netherlands, located within a walking distance from both Belgium and Germany. It is known to be the oldest city of Netherlands and the capital of “Limburg” province. With a long history – tracing back the Roman era, spectacular monuments, magnificent cathedrals, and beautiful old houses/streets, Maastricht is full of surprises and was perfect for 2 days tour. By Flight: If you come flying, Eindhoven airport could be the nearest (approx. 1.5 hours drive); From Schiphol it’s 2 hours distance and the same travel time if you land in Belgium/Brussel too. There are plenty of options for accommodation in the Maastricht., ranging from student hostels, motels to 5-star luxury villas. But, we stayed at Lanaken – a nearby town in the Belgium. It is less than 10 minutes’ drive (6.5 Kms) from Lanaken to Maastricht city centre and it is very cost-effective! we got a 4-star hotel double bedroom with breakfast for just 60 EUR /night. How did we roam the city? Walk: Yes, we parked our car in the city centre and walked all over. Probably, walking is the best way to Maastricht (perhaps, true for any city in the Europe!). If you are little immobile or has less time, you can choose to go with bike or city tour bus. What attraction did we see (Itinerary)? 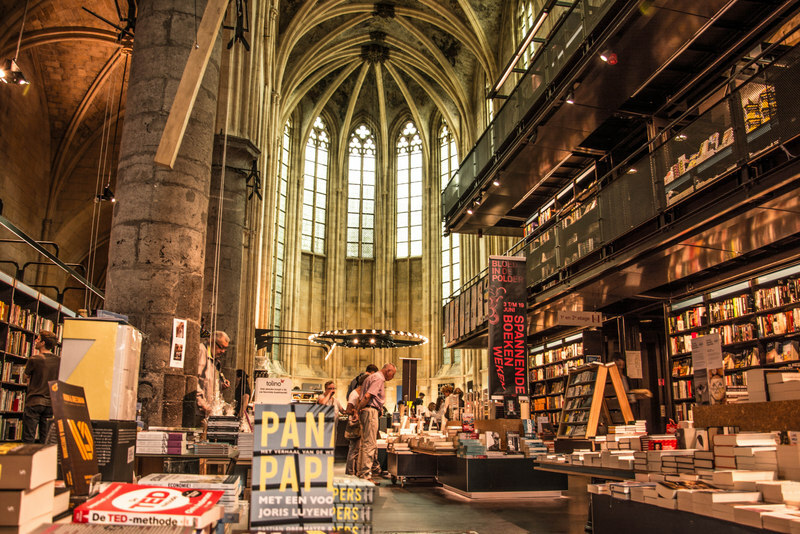 Boekhandel Dominicanen - a 700 year-old beautiful cathedral converted into a huge book store. Helpoort – the watch towers and walls of olden days. Museumkelder Derlon – a small exhibit/collection of the ruins of Romans in Maastricht. Mount Saint Peter & Caves – an awesome experience of age old underground caves system. Will write more on these places, about their interesting facts, history, opening times, and ofcourse my tips/guides, in the coming posts. Keep following!